Hey everyone! Welcome to the Birthday Bash and my Inspiration Challenge!! CHALLENGE: Get inspired by the photo. Pull out a color combination, image, or theme. Create anything your heart desires! You’re not required to use Taylored Expressions images for our challenges. KEYWORD: Upload your creation to your blog or online gallery (or both). 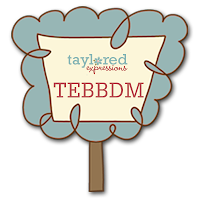 If you’re uploading to online galleries, use the keyword TEBBDM. Then come back to this challenge and leave a comment with a direct link to your creation! In order to be eligible for the prizes, you must leave a comment with a link to your card by midnight PST Wednesday, September 9th. I think there are so many great elements in this photo to work from and I hope you like it too....the polka dots in the costume, the Halloween theme with the grouping of pumpkins and the ghost, the colors, the outdoor feel, and hey...there's a cupcake in it! I went with the polka dot and pumpkin theme for my card. The grouping of pumpkins in the photo totally reminded me of this pumpkin cuppie stamp from Year of Sweets III ...I love pumpkin stamps! Don't know what it is about them, but I love them! The punched sentiment and orange deckled rectangle behind the main image are both up on Taylor's foam tape. The square button and Intense Orange card base are from the newest Bundle & Key Ingredients that were just released in the TE Store today! The layout is Jen del Muro's sketch from Aug, 29th. I can't wait to see your cards, and good luck in the drawings!! What a sweet picture. I used it right away as I need a baby card by tomorrow. What a cute picture! I was inspired by the ghost on the ground. I wanted to work a cupcake into mine, but I had these pumpkins stamped and ready to play, so... :) Thanks! SUCH a fun inspiration piece! love this photo! thanks so much! What a great inspiration challenge. I pulled from the little ghost bag!! Love the card you created, and the photo is just great! Thanks for hosting! I had to do a cupcake for this card! And woo hoo, this is my final card. Great card! 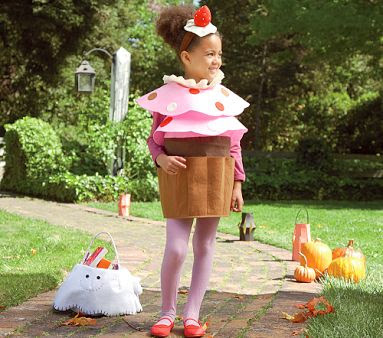 I love that cupcake costume that your was inspiration too. I went with the colors (pinks, white), a variation on the cupcake shape with the hearts and the outdoors theme with this card, combining a couple of challenges.